Here in the South, nothing goes better with a good bodice ripper than a nice mullet! The Blu-ray has two exclusives not on the sDVD version. There's a BD-Java interactive overlay for the film that brings up pop-up facts throughout the film as history flies by. There's also an interactive true-false quiz that you take as certain historical facts are spouted in the movie. Some, of course, are false and only stated to make the movie for compelling. Nice little test of American historical knowledge. I only scratched the surface of this feature - about 20 minutes' worth of it. The other exclusive is two additional deleted scenes not on the sDVD. I didn't listen to the commentary track yet. I'll do that tomorrow. I did look at all of the other documentary features about the various sets and action scenes in the film. There were 10 in all. I know there are several Easter Eggs on the disc, but I haven't found them as yet. The first garden we went to was one of my favorites, it was so unusual and personal. I imagined it belonged to someone who was an artist. The owner has her own garden design business, specializing in edible gardens that require little water. She gave me her brochure for her business. I noticed her name: Vanessa Vadim. I said, "Oh, like the director". She said "Yes, he was my father"! So we were talking to Jane Fonda's daughter. Who knew? She was very nice, and knowledgeable about plants! Yes, that would be Jane's daughter. Going to write for awhile now and then head down to bed. *These pics are almost "life-size". Almost. 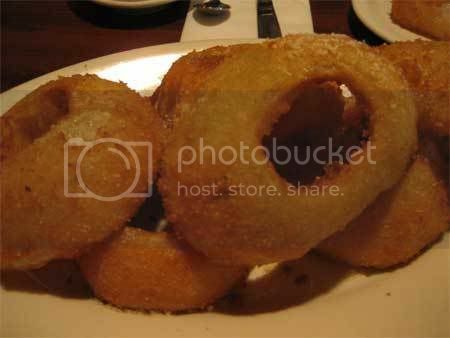 Jose, I am now hungry for Onion Rings... Those look delicious.. 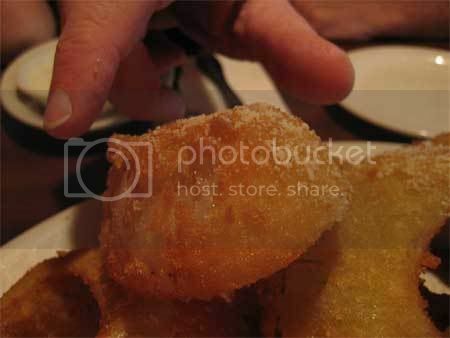 The piece of cake looks good also.. If i get a telly that is either digital or hdtv will i need antenna for a garden level apartment or will the internal tuner be enough? This happens to me a LOT! And in all the browsers that I have, but mostly in Internet Explorer, and only on my home computer. My work computer NEVER slows down like this. I can't use IE at home but ti seems to work fine at work. I use Mozilla Firefox at home. 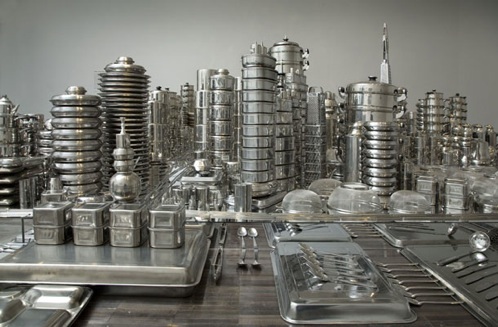 Beijing-based artist Zhan Wang sculpted the San Francisco cityscape out of pots, pans, graters, and other kitchenware. The piece is part of a new exhibition of Wang's work at San Francisco's Asian Art Museum running until May 25. What, we can't even get to 200 postings? A lot of annoying downtown traffic coming home. REALLY annoying. Pretty full house tonight and a nicely vocal audience - lots of laughs, but a couple of actors have started changing up what they're doing and not for the better, so when I'm at our put-in rehearsal, I'll be having a little chat with the company and then the couple of actors privately - but mostly a very good show. Although, there were like five or six people (I guess there always are) whose attitude seems to be "I won't laugh no matter what you do, and I don't care what you do I'm just going to sit here and not show anyone any emotion and I'm basically going to not enjoy myself no matter what." Now I must write some notes, although I suppose there's no hurry since there's nobody here but us chickens. TCB, I'll print the list of books in the morning - there's some really nice stuff. well, imagine my surprise, when the stage manager said, "Places, please..." and I sat in my little chair in my little loft... looked out over the packed house... and spied: JOSE!!! I had no idea he was in town, and yet, there he was at my show!!! After, I wiped my face and scurried out to see our boy - what a joyous reunion! He reminded me he hadn't been out to LA since What If? - which was four - count 'em - four years ago! So much water under the bridge since then.